MOV (H.264) *Limited to video and audio stream formats normally readable through the MPEG Reader. MKV (.mkv) *Limited to video and audio stream formats normally readable through the MPEG Reader. * MPEG-1 in 8-bit YUV 4:2:0 format only. * MPEG-2 in 8-bit YUV 4:2:2 format only. * H.264/AVC in up to 10-bit YUV 4:4:4 format only. * H.265/HEVC in 8/10-bit YUV 4:2:0 format only. * The suitable mode is automatically selected according to the source file. * Available setting value depends on the source file. Transcode Setting Possibility to specify a post-transcode file size. * Specifiable lowest size depends on the output format. * Transcode applies only to MPEG-1/MPEG-2 materials. * The multichannel setting is possible when the output setting is an Elementary Stream or is HDMV compatible TS / AVCHD Progressive (BDAV H.264/AVC); some bitrates are not available. The bitrate value change depending on the 48 / 96 / 192 kHz, monaural / stereo / 3 / 4 / 5 / 5.1 / 7 / 7.1 ch, or 16 / 20 / 24 bit used setting. *Available bitrate depends on the sampling rate and number of channels. ** The available stream format depends on the output target and container type. The available setting value also depends on the stream format and container type. 7 ch / 7.1 ch is available when using Linear PCM in an MPEG file for BDMV/AVCHD output. Smart Rendering Analyzer Possibility to verify in advance the amount of re-encoding at output. When outputting in One Clip per Program Mode, possibility to analyze each program separately. * 5 ch / 5.1 ch available when using DolbyDigital, MPEG-2 AAC Usable audio format depends on the outputted BDAV standard format. When using the dual channel mode, it is possible to change the audio of a bilingual audio (recorded with the left channel as main, right channel as secondary audio) on a Blu-ray disc player deck compatible with the bilingual system. It is usable only when the video format is SESF compliant. When setting the BDAV output, the master Clip's video characteristics must match the BDAV specifications. * TMPGEnc MPEG Smart Renderer 5 English version supports only iVDR digital recording files. Source Range Allows you to specify an arbitrary start and end frame within the source video. Fast Navigation Allows you to use the fast navigation functions to rapidly cut-edit the source. Undo / Redo Registers up to 50 cut-edit, source range and keyframe changes. Playback Audio Volume Allows setting a playback audio volume in the Cut-edit and Output preview windows, independently from the actual outputted audio volume. Cut-Editing Allows you to arbitrarily cut segments of the source and output only what remains. Can also cut multiple specified ranges at a time. Keyframe point setting When outputting in MPEG, allows you to arbitrarily specify I frames. Keyframes can be changed into clip split points. Keyframes can be used as chapters (In a Blu-ray, etc., functions as a chapter entry point). Fast Keyframe Addition Allows you to automatically set multiple keyframes according to a specified interval, number or time. Clip Splitting Allows you to arbitrarily set split points within the source, segmenting one clip into several new independent clips. Aspect Ratio Conversion Allows you to set (change) the aspect ratio of the output. Noise Reduction Reduces the random noise from analog, broadcast recordings, etc. 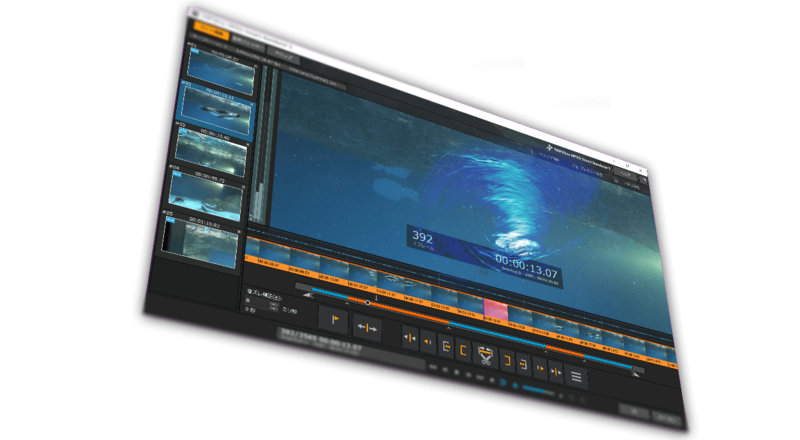 Gap Correction Allows you to correct a video/audio synchronization issue by the millisecond. Normalization Changes the volume so the highest audio level is equal to or lower than 100% of the output. Commercial Candidates Detector / Pre-Commercial Candidates Detection This function analyzes the selected clip(s), and detects the most likely candidate positions of commercials. The detected candidate positions can be registered as keyframes or split points to the clip. Pre-Commercial Candidates Detection is capable of analyzing multiple clips continuously. iVDR-S Editing Support Allows you to edit a file which is recorded by a iVDR®-S media (supported devices only) and return to the media. TS/PGMX/MXF Importation and Analysis When an MPEG-2 TS, PGMX or MXF contains several streams, its content is analyzed, then video and audio data can be selectively imported. * Subtitle data is not imported other than ISDB standard subtitle streams. Everio Video File Support Can import the video recording data (MOD format) from the JVC "Everio" hard disk video camcorder. Timecode Corrected MPEG File Input Elimitates any audio gap by using the timecode correction data contained in certain MPEG files. Color Clip Allows you to create a color matte, gradient, or pattern clip from a video generator using parameters or pictures. Title Insertion Allows you to add several titles in a clip. Clip Edit Window Customization Switch on/off the audio waveform or thumbnail display, enlarge or reduce the display range, etc. AAC/Dolby Audio Channel Analyzer Function Analyzes the audio to find the maximum number of channels and where the number of channels changes. Allows you to register the found channel change points as a "keyframe" or a "Clip split point". Video Capture Saving Saves the picture in the preview to a picture file (BMP, JPG, or PNG format). Keyframe File Importation TMPGEnc MPEG Smart Renderer 5 allows you to save or import keyframe data. Supports the importation of a keyframe file (.keyframe) generated by our other applications such as the TMPGEnc Video Mastering Works series. Keyframe List Preset Allows you to save and call the keyframe list you set as a preset at anytime and apply it to other clips. Direct Registering of Clip Split Range Allows you to register directly an arbitrary split range to the Clip list without closing the Clip Edit window. Quick Cut Possibly to cut a range directly when a start (or end) point is set without clicking the Cut button. Output Preview Allows you to verify the video and audio output status just before the encoding stage. Standard Output Function Allows you to automatically launch the main application and edit or perform a standard output just by dragging and dropping a video file on the TMPGEnc MPEG Smart Renderer 5 shortcut created on the desktop or other location. Single File Splitting and Output Possibility to split a file and output it by using the clip splitter. When outputting each clip separately, possibility to analyze them separately. Re-encoded Parts List File Export Possibility to export a file which indicates the re-encoded parts of the clip when outputting. Audio Sampling Rate Conversion Allows conversion from a sampling rate to an arbitrary sampling rate while keeping high audio quality (From 8 to 192 kHz, 32 bit high-precision floating point processing). Post-output Final Task Automatically shuts-down, goes into stand-by, or hibernate mode when the output process is completed (available options depend on the machine and operating system). Uses NVIDIA CUDA™ Can use NVIDIA CUDA to perform filtering calculations, MPEG-1 / 2, H.264/AVC and H.265/HEVC decoding. * Requires the installation of an NVIDIA CUDA compatible device and the compatible driver, and the CUDA device functions correctly. Uses Intel® Media SDK Possibility to decode MPEG-2, H/264/AVC and H.265/HEVC by using a hardware decoder through the Intel QSV. * Requires the installation of a QSV compatible device and the compatible driver, and the QSV device functions correctly. Uses AMD Media SDK Possibility to decode H/264/AVC by using a hardware decoder through the AMD Media SDK. * Requires the installation of a AMD Media SDK compatible device and the compatible driver, and the QSV device functions correctly. Jog Shuttle Support Key shortcut definitions in the clip Cut Edit window includes those used by a jog shuttle. * Only the Windows controller is supported. Panel Brightness Setting Allows you to adjust the brightness of the principal application panels. * Cannot be applied to the clip-editing window. Batch Tool Registers several encode/output jobs, and outputs them one after the other automatically. MPEG Tools Multiplex or demultiplex the video and audio of an MPEG file. Includes a batch processing option. Production Tool Equips the tool for reducing editing work process which can add clips automatically in the specified folders by using folder monitoring. Also, it can automatically operate the Commercial Candidate Detector and Indexing for Seeking functions. News Center Online Notification Receives update information, etc. directly from Pegasys. *1 Because an MPEG-1 generated in VBR (Variable Bit Rate) cannot, according to the specification, be specified as a Master Cip, this format cannot be outputted alone. Import this file with another file usable as a Master Clip (CBR [Constant Bit Rate] generated MPEG-1 file, DVD/Blu-ray or other standard compliant file...) and output it as a Rescue clip. (In such a case, the MPEG-1 VBR clip is entirely re-encoded at output.) *2 Depending on the settings and device used, an audio gap may appear in the captured movie data. Use the trial version to verify the quality of your capture system. *3 Transport stream importation tested with sources generated by a JVC GR-HD1 and a SONY HDR-FX1/HC1. *4 Supports video files generated by the TMPGEnc series software encoder, most capture devices and DVD recorders. Depending on the settings and device used, an audio gap may appear in the captured movie data. Use the trial version to verify the quality of your capture system before purchasing the retail version. Partially damaged source files may not be imported at all. This application cannot process DVD-Video protected by a Copyright or anti-copy enforcement system such as CSS and CPRM. *5 DVD-VR importation requires a media compatible drive and UDF 2.0 support. Standard Windows installations are not able to copy or read the UDF 2.0 format, so such functions cannot be used. This application cannot process DVD-Video protected by a Copyright or anti-copy enforcement system such as CSS and CPRM. *6 Blu-ray (BDAV/BDMV) importation requires a media compatible drive and UDF 2.5 / 2.6 support. This application cannot process a Blu-ray (BDAV/BDMV) protected by a Copyright or anti-copy enforcement system. *7 Microsoft TV PVR file (*.wtv) importation requires the computer that recorded the video, or a computer that supports Media Center PC video recording file playback. WTV file importation is possible on the computer used to record the file, or on a computer able to create this type of file. Recordings copy-protected by a DRM scheme cannot be imported. Only WTV files containing MPEG-2, H.264/AVC video and MP2, AC3 or AAC audio can be imported. *8 Supports the importation, output and conversion of Dolby Digital audio 1 ch (monaural), 2 ch (stereo), and multichannel (5.0, 5.1). It is not possible to have more than one instance of the Dolby Digital audio encoder working on a given system. Using Dolby Digital audio in several instances of the TMPGEnc MPEG Smart Renderer 5 main application at the same time, with the Batch tool, or using the Batch tool in parallel output mode is not possible. *9 File linking for MPEG files with different characteristics is practiced according to the criteria parameters of the Master clip. *10 Requires a compatible disc drive (BDXL writing is not supported in this application). The BDAV format does not allow a menu. This function supports only BDAV compliant files. The outputted BDAV standard format depends on the input file. *11 The profile and level depend on the MPEG-2 input file. *12 Depending on the player type, the chapter may not display. *13 SESF requires a BDAV compatible player. Support of the HDV and other HD resolutions' materials differs according to the player. *14 Viewing the outputted BDAV character code requires a compatible player. *15 Requires a player that can display the disc title/program title name and the character code. *16 Minimum and maximum resolutions depend on the broadcasting standard. *17 Value depends on the broadcasting standard. *18 The Maximum value depends on the broadcasting standard and resolution. *19 AAC (Advanced Audio Coding) importation supports audio data sources of up to 5.1 channels. *20 Dolby Digital Plus importation supports audio data sources of up to 7.1 channels. Partially damaged source files' video may not be imported at all. Some supported format files may not be smart-rendered depending on the video parameters. Some VOB and VRO files recorded in the DVD-Video/VR format may not be correctly processed. (always use the "From DVD/Blu-ray/AVCHD" option in the Source Wizard). Some MTS and M2TS files recorded in Blu-ray/AVCHD may not be correctly processed due to the file's internal structure. Preferably use the "From DVD/Blu-ray/AVCHD" option in the Source Wizard. This application cannot process DVD-Video or Blu-ray content protected by Copyright or anti-copy enforcement systems such as CSS or CPRM. Cannot import files from devices other than the IO DATA’s supported devices. Please verify before using it. The recoding file importation requires an environment where the supported IO DATA device has been correctly connected to your current PC and "iVDR-S Media Server 4 version.4.0.48.0 or later" or “iVDR-S Media Server 3 version.3.27.34.32 or later” is correctly installed. This template is not displayed in other environments. You cannot add and edit multiple files in this application. When you wish to edit multiple files, please create a new project for each file. A recording file which is prohibited to move cannot be edited and outputted. When a recording data contains different aspect ratios (16:9 / 4:3), the output file will be encoded according to the aspect ratio set in the Clip Properties, and the other aspect part will be encoded with black frames in order to avoid distorted video. Cannot import subtitles which does not meet the ISDB standard. H.264/AVC recording contents other than that of SKY Perfect HD is out of the performance guarantee.